Cut it out, stitch it on, done! 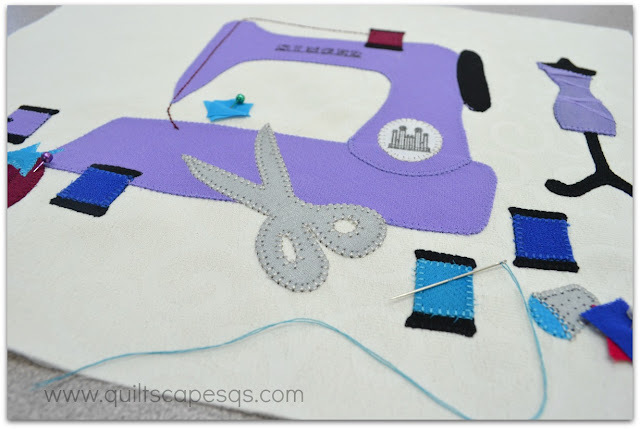 For applique' the easy way, a blanket stitch is my go-to. Many recent projects have had some sort of applique', and all of them used a blanket stitch. Applique' turned this Simple Sadie quilt into something super sweet for my niece's new baby! I love to take clues from a cute print and enlarge the motif. A blanket stitch is formed with a straight stitch along the outer edge of the applique' followed by a perpendicular stitch in and out of the applique' shape. 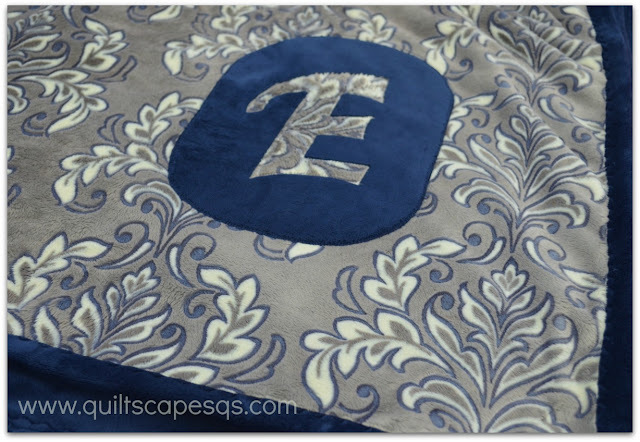 I think it gives a neat, clean finish to raw-edge applique'. 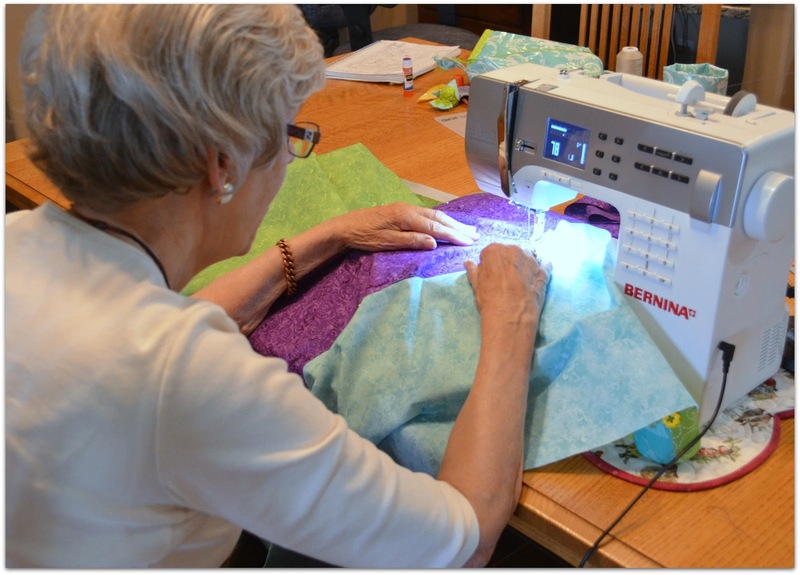 Don't have a blanket-stitch option on your machine? Try another decorative stitch, blind-hem stitch, even a shortened zig-zag stitch. * You know that little hole on the hook of the bobbin case? Now is the time to thread the bobbin through it! This creates a little bit of extra tension so the bobbin thread won't peek through to the top. Or you can reduce the top tension by a little. Or do both. * Test your stitches on a scrap of fabric. If you find that it puckers too much, try using a stabilizer such as freezer paper. Press the waxy side of freezer paper to the wrong side of your fabric. The stitches will perforate the paper and you can tear it off afterwards. Play with the stitch length and width to see what looks good to you. 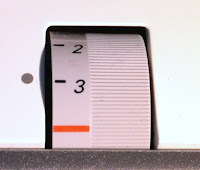 I generally use a width of about 2.0 to 2.5 with the stitch length also at 2.5. * I like to match the thread color to the applique', but some people use black thread overall for a rustic, folk-artsy charm. * Position applique' using lightweight fusible web, glue stick, 505 fabric adhesive spray, or pin in place (see more ways to prep and stitch in my raw-edge machine applique' basics tutorial: I ♥ Applique'). * If possible, use an open-toe foot so you can see where you're stitching. 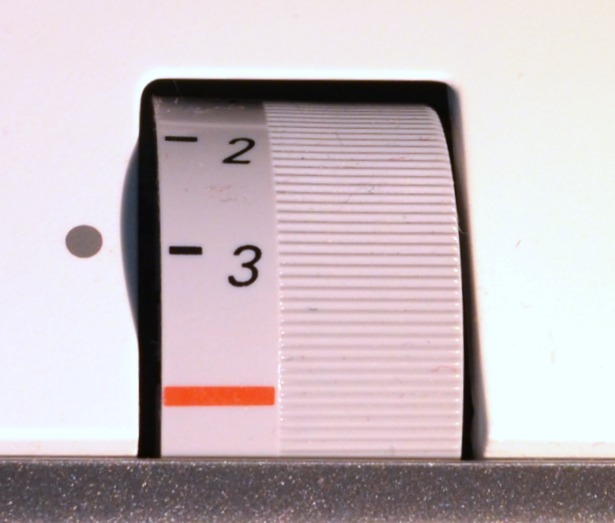 If you position your needle to the right, it will be easier to gauge where the fabric should line up. 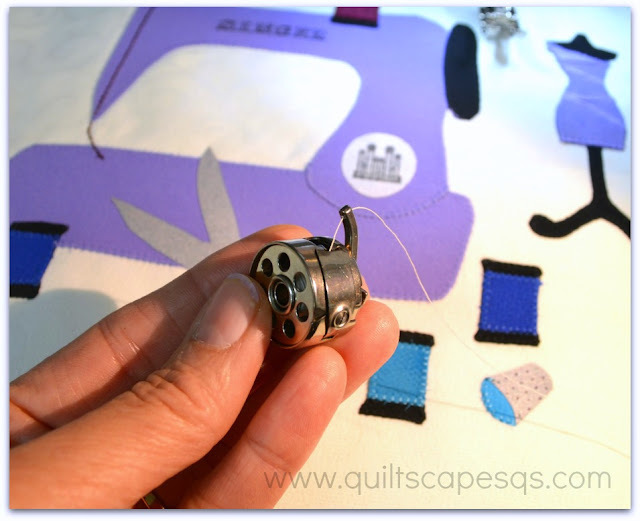 *Stitch in the ditch for the forward-moving stitches - the needle should hug the applique' edge for the outline stitch in the background fabric. Aim for a perpendicular line from the edge for the horizontal stitches. That can be a bit tricky on curves, but if the needle is down, it's easier to accomplish. Pivot with the needle in the "ditch", either before or after the horizontal stitch. Sometimes, you just have to slow down and operate one stitch at a time. 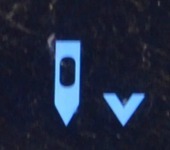 * Some machines have a needle down option - very useful so you don't lose your position, especially when pivoting to change directions. Otherwise, use the hand wheel to position the needle down. *Lock stitches at the beginning and ending by holding the fabric so you get a couple of stitches in the same position. 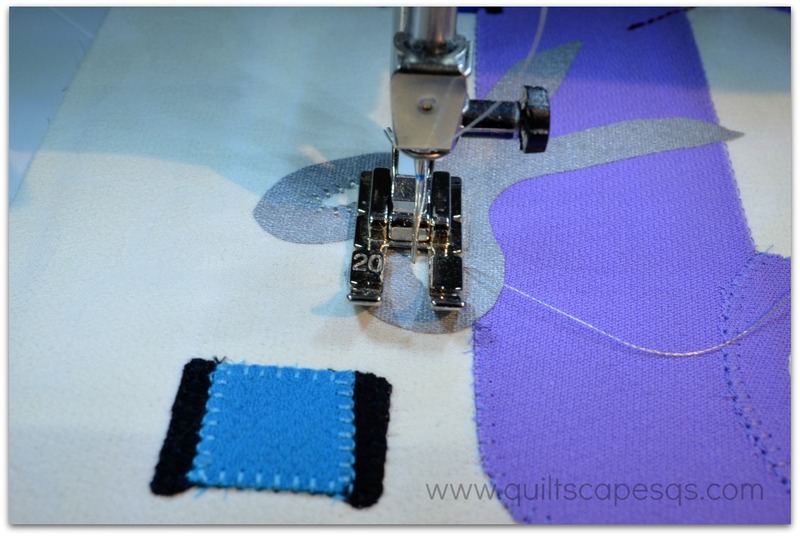 If sewing around a shape, overlap the end stitches over the beginning stitches. Little wall-hangings for choir seamstresses using scraps from our choir dresses. A comfy, cuddlesoft comfortor for someone special. The other day, my Aunt & Uncle came over to make some quilts for gifts, also blanket-stitch applique' projects. Uncle Jack cut everything out and Aunt Margie got a good start stitching them down. We used 505 basting spray to adhere the pieces. They both rocked it!! (See their final results HERE.) Ü Not bad for a couple of 83-year-olds! Loved it! such a clear tutorial, must have a go at applique, fortunately have a needle down position on one of my machines, really miss it if I use my featherweight instead. Your Aunt land Uncle look so much younger than they are, hope I age so well! I've been sewing all my life and never noticed a hole in the sticky-uppy part of the bobbin case! I'll have to check it out! I was thinking the same thing Margaret said! They look much younger than 80's! You are the queen of raw edge appliqué!! Love the baby quilt, a treasure for sure!!! Thanks for all the tips too! Thanks so much for the hints. Your applique always looks so perfect. It sounds like you three had fun creating! Had to rush to my machine to see if it has a hole in the bobbin case - awesome! I'd love it if my blanket stitches looked HALF as good as yours. Thanks for all the tips. Your aunt and uncle look like great sports. I really enjoyed this post! 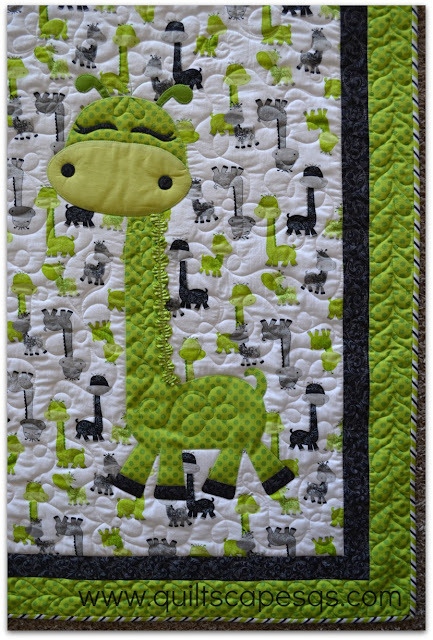 Your giraffe quilt is SO cute! I love your tutorial and the pictures! I'm thinking this is the cutest quilt ever!!! I almost always use a blanket stitch because I love the look. 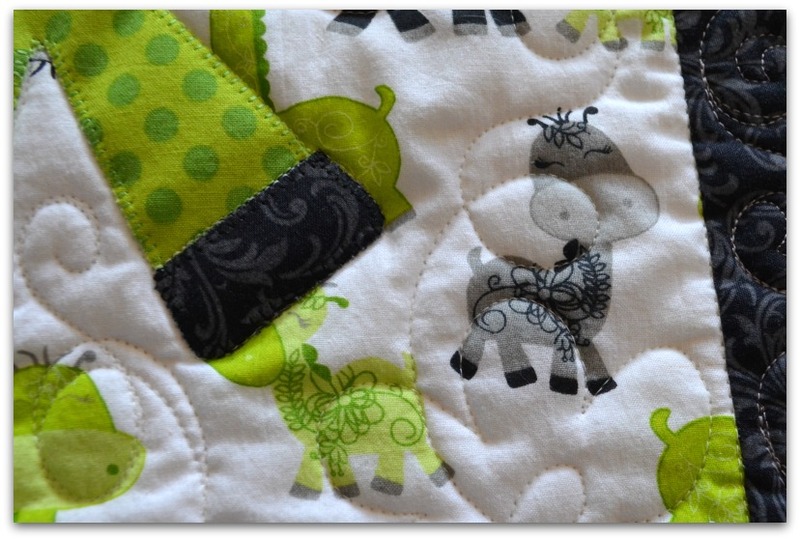 Your applique looks amazing and I love that giraffe! Cute! Deon, thank you, I downloaded the pattern and have started the project. I was able to find the Gigi Giraffe material at my local Hobby Lobby but not having much luck locating a similar green polka dot or the striped material. Would you by chance happen to remember where you purchased this material? Thank you so much for your help. I would love to know the same....how did you resize the gigi giraffe? I copied the giraffe photo from the site into a word document and simply enlarged it by by dragging the corner. Since the giraffe is larger than the size of the 11x14 paper I was printing on I printed the giraffe in pieces. I decided on the size of the giraffe then positioned the top half of the giraffe on the page and printed. Then, without re-sizing anymore I moved the bottom portion of the giraffe up on the page and printed. I cut out the two separate pieces of the giraffe and then taped together where the overlap occurred. Hope that makes sense. I think my giraffe ended up being around 18 1/2" long - not including the spikes on top of head. Where can I fine the giraffe at. I jave the fabric just need him.